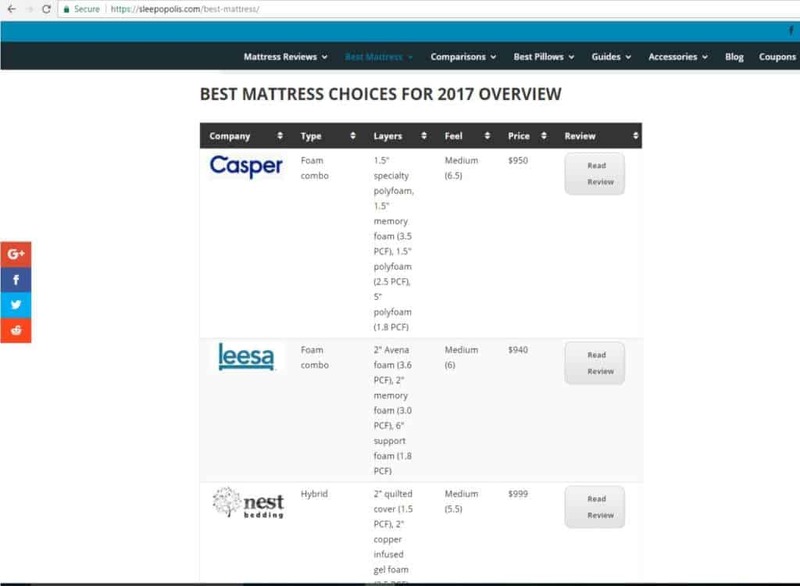 Sleepopolis was owned by Derek Hales who was being sued by Casper as they felt that Sleepopolis.com directed readers away from Casper mattresses towards other competitors, citing Leesa Sleep, Ghostbed, Nest Bedding, Novosbed, and Purple. I have read the complaint by Casper (Updated 8.11.17 it is linked below) and one of their main issues was that Leesa’s coupon appeared higher on each sleepopolis.com page. So here is where it gets interesting. Now that Jakk Media LLC is the owner, the sidebar has been changed. Can you guess who’s coupon reigns supreme? Wait for it… Casper, yeah that Casper is now at the top of the sidebar on every sleepopolis.com page. Here is an example snapshot from sleepopolis.com on 8/4/17. In July 2017, a subsidiary of JAKK Media LLC acquired Sleepopolis.com. Casper provided financial support to allow JAKK Media to acquire Sleepopolis. Derek Hales and Samantha Hales are no longer associated with Sleepoplis.com. We maintain an affiliate relationship with some of the products reviewed as well, which means we get a percentage of a sale if you click over from our site (at no cost to our readers). Did you notice the part that says that Casper provided the funding? I’m just an outside observer, so I don’t have any details of the sale/or settlement. I’m willing to bet that a large sum of money went from Casper’s bank account to Mr. Hale’s account and that the lawsuit was settled. So, did free speech lose out to a large corporation? Were Casper’s claims against Sleepopolis justified? Is anyone going to believe that Sleepopolis.com in it’s new form is unbiased? Is sleepopolis.com going to be an elaborate website designed to get customers to purchase only Casper products? 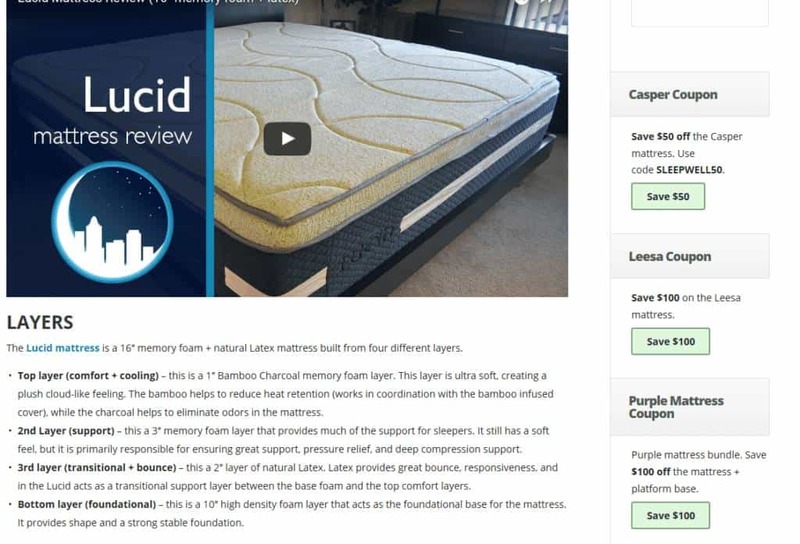 Is Casper going to make money when readers click their links and purchase rival mattresses? I mean someone has to see the irony here! As a side benefit the Casper coupons are much easier to find, now that they are at the top, and even above Leesa! I don’t have any answers to these questions, I’m really just thinking out loud as it’s shocking when a review industry leader changes hands like this. Another interesting side note is that JAKK Media also owns mattressclarity.com and slumbersage.com. So with this media consolidation there are fewer and fewer companies that aren’t owned by the mattress companies that they are reviewing. 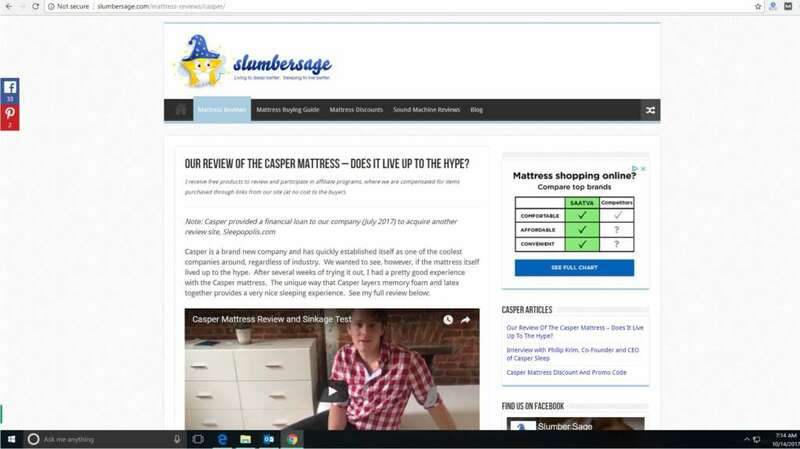 It’s interesting that Slumbersage.com has a disclaimer saying that Casper gave them the loan, yet mattressclarity doesn’t have a similar disclaimer. My assumption there is that mattressclairty is doing the best it can to hide this unusual funding situation. Nonbiasedreviews.com is independent and relies on our viewers to help us by clicking on affiliate links if they are interested in the products that we review. That is our sole source of income and believe me we are way in the red. So please consider that you want an independent company to test out the products that you are looking at rather than seeking advice straight from a mattress company. My mind tells me to just stay out of this, but curiosity hit me and I went on the “new” sleepopolis.com site today. If Jakk Media LLC just wanted to expand their review empire, I would think that bank or venture funding would have been the more arm’s length move. Instead, seeking funding from Casper makes all of the sites that they own far less credible. For example: I clicked on a Sleepoplis.com link to Leesa coupon code. Had I purchased a Leesa, then Jakk Media would have gotten some money. This money would then be pooled against their expenses and one of those expenses would be the loan to Casper right? Well what if the Jakk Media company suffers financial losses? How would they pay back Casper? As Casper Sleep Inc. provided the funding, surely their note would provide some form of collateral right? In this scenario, Casper would likely have the contractual rights to take over Jakk Media LLC, if they can’t pay back that loan. If Casper Sleep doesn’t technically “own” Sleepopolis.com, then they are pretty close. I’m willing to bet that they have some serious sway in the way that these sites portray Casper’s products now. Other things of note: the coupon side bar which had displayed Casper at the top has now been removed from all of the pages that I visited. If there have been drastic changes to the Casper mattress since Mr. Hales reviewed it, then it makes sense to do an update and change some things around. It likely won’t be an apples to apples comparison since Mr. Hales likely won’t be their reviewer any longer. 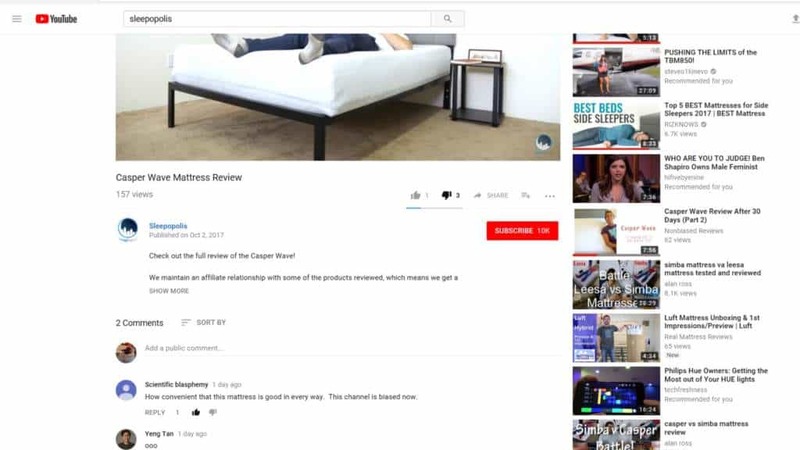 Still I find it funny that they took down the review of the mattress since it has been updated, but left the picture of the “old” mattress that was taken in Derek Hales’s showroom/bedroom. Anyway you slice it, it looks like Casper Sleep Inc. got what it wanted. Now, is Jakk Media going to push Casper products aggressively through all three of their review sites? Or are these sites going to provide non biased information about the mattresses that they are testing? I also wanted to note that I have always had a Casper referral code on my website. Casper gives out those codes to people who purchase their products. Their program provides an amazon gift card of $50 for each referral sale, maximum 5 per year. We have maxed out those 5 sales ($250 total). Even though we don’t have a true affiliate relationship or any further financial ties with Casper we continue to provide the link as a benefit to our readers. Furthermore, I have absolutely no idea how many people have clicked on that link, nor do I know how many sales have been generated by Casper from those links. Personally I don’t have any problem with Casper’s products (In fact, I just bought the Casper Lounger). However, I think I’m justifiably concerned about their financial interests in other review companies. My concern is for consumers of sleep products which is the guiding principle behind the FTC regulations about affiliate marketing. The FTC doesn’t care who is spreading information about product X, they just want to make sure that if the writer or actress, or social media personality, is getting money from company X that they need to disclose that. Casper, whoops I mean sleepopolis has replaced the original editor that they had for the first month after the take over. The new reviewer, Logan, now shoots rapid fire reviews (like one a day) from what looks like a studio. The mattresses are twin sized and he’s a big dude. I’m not sure how they let that slip by, there is no way that he is sleeping on those, well maybe, but I’m guessing he’s not. All old videos that Derek shot are now replaced with 3 second sleepopolis ads. This was an very smart way to scrub out the old Casper reviews so that they can be replaced with the new “upgraded” Casper reviews. The reason I brought this up is that he has some really nice things to say about the Casper Wave, which did not preform well on my 2 plus week sleeping (well trying to sleep) tests. You can read about my experience with the Casper Wave. It’s clearly different than his. He says that the polymer section will “contour to your body in the correct way to keep your spine aligned.” Clearly different than my actual sleep experience, but everyone has different sleep styles so maybe that wasn’t just from the Casper sales brochure. Plus he is much heavier than I, and I point out several times that maybe the Casper Wave just isn’t for petite people. Viewers are starting to notice the affiliation of Casper and Sleepopolis. You can see from this comment on their YouTube page that there is a perception that Sleepopolis is no longer unbiased and in control of their reviewer’s opinions. Side note, I was thinking they may want to rebrand to Casperopolis.com. I went to Godaddy and someone else owns it and it’s now a parked landing page. At least I got to laugh that someone else thinks that the unusual take over of the largest mattress reviewer should be renamed. Although, I guess it’s possible that someone had registered that .com before the Jakk Media/Casper take over of Sleepopolis. Part of Casper’s complaint against Sleepopolis was that they were using non compliant FTC regulations (deceptive advertising). 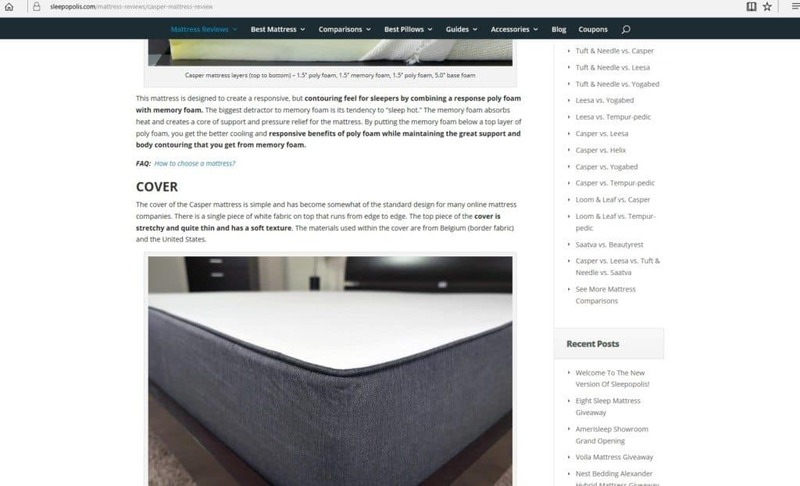 Is it not a deceptive advertising tactic for the #1 traffic review site, Sleepopolis, to rank their parent company Casper as the #1 Best mattress choice (s) for 2017? How is it that the FTC, which has the purpose of protecting consumers, has not noticed this amazing conflict of interest/deceptive advertising? Look no further than the screenshot below! I found this interesting graph on similar web. Part of my understanding of Casper’s suit against Sleepopolis was that too much traffic was flowing to: Leesa Sleep, Ghostbed, Nest Bedding, Novosbed, and Purple. 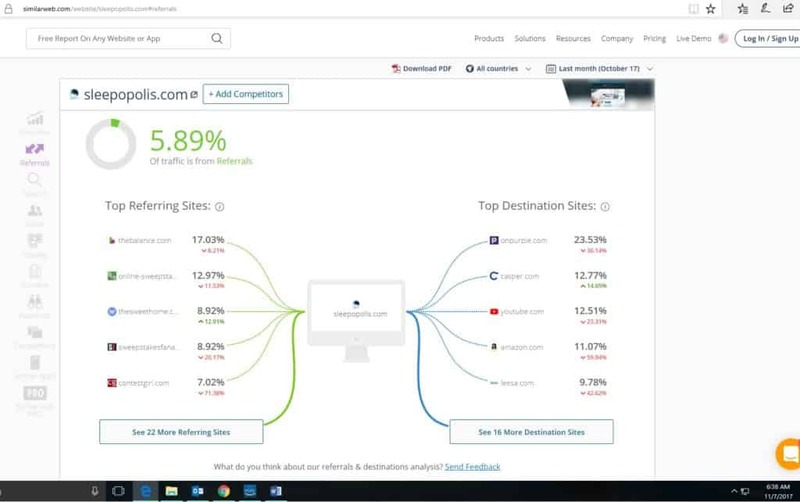 So when you look at where the traffic is going, you will see that much less traffic is going to youtube (no surprise there). The quality of Derek’s videos vs Logan’s and the fact that Logan puts out a new video everyday (aka not sleep tested). The destination of Purple is way down, as is Leesa. The company in the green? Casper. Therefore, it appears as if their goal of shifting traffic from Sleeopolis to Casper is working. I think I’m done updating this as Casper set out on a mission to get more traffic away from their competitors and they achieved it. I can’t fathom needing to explain this any further, let’s just declare Casper the clear winner here. I didn’t plan on updating this post, but I ran into an amazing footnote in the court documents of the Serta vs. Casper ongoing lawsuit. There are way more details on this page: Serta Simmons Bedding, LLC et al v. Casper Sleep Inc. In case you haven’t been following along, Sleepopolis is the one referenced as the one which did not immediately agree to settle. Folks, you just can’t make this stuff up! Does this happen in other industries? Would GM buy Consumer Reports if they didn’t like a car review? If Casper Sleep doesn't technically "own" Sleepopolis.com, then they are pretty close. I'm willing to bet that they have some serious sway in the way that these sites portray Casper's products now. Go Casper. Didn’t like the sound of Derek. Not a fan. Very deceptive man. Hopefully Casper and new ownership don’t follow what he started. Is it that hard to get a true unbiased mattress review? If not can we please get disclosures on who owns what? Or who’s being paid what and by whom? The new site has at least started to disclose some of this. Go Casper. Go new ownership. I can see that side of the issue, the old site did have a ton of don’t buy a casper buy a YYYY. Buy why not just go to the bank to get a SBA loan to buy it, why did Casper loan out the money? I mean is Casper a bank too? Very interesting stuff. I had to comment because it would have been a shame to have no comments on such a thorough and thoughtful article. I bought my mattress shortly before all of this stuff went down, but I used sleepopolis as one of my resources. I visited the site tonight just out of curiosity and noticed that it was pretty different. Then i saw that there was a different guyin Derek’s place. A google search for “sleepopolis sold” led me here. Thx for filling in the holes of the acquisition disclaimer on their page. I was aware of the Casper lawsuit, so I suspected that was the root of it. Seems like the very definition of a hostile takeover. It’s a shame that Derek caved to Casper and sold, but hopefully he at least made a lot of money. With that said, I will most assuredly never buy a Casper product. I don’t like companies that use bully tactics. Thanks for sharing. I wonder if the same kind of stuff happens in other industries.